New science fiction book by Allen Pollens “GIFT OF THE PHARAOHS – Renaissance Egypt” is high action from beginning to end. It starts with the awakening of a 5000 year old Pharaoh from his deep slumber. It continues with the Pharaoh’s amazing quest to create an Egyptian renaissance. Beaverton, OR, July 31, 2017 --(PR.com)-- It all began in 3150 BC with the Egyptian civilization that resulted from the unification of Upper and Lower Egypt under the first Pharaoh. It was the start of a history of many stable kingdoms. “GIFT OF THE PHARAOHS” offers 80 images of historic sites up and down the Nile, all in color in the Kindle edition. 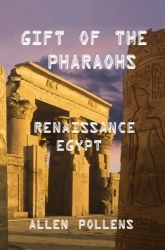 “GIFT OF THE PHARAOHS” is available at Amazon.com in print and for Kindle. The current price for the print version is $14.99 and Kindle just $2.99.